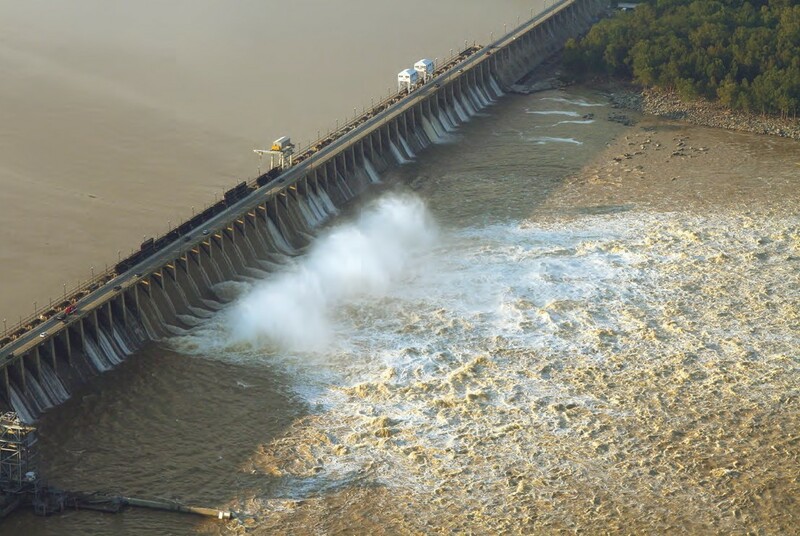 View of the Conowingo Dam on the Susquehanna River in the aftermath of Tropical Storm Lee taken Sept. 12, 2011. Discharge at time of the photo was 220,000 cubic feet per second. Peak discharge for the flood was 778,000 cubic feet per second at 4 a.m.on Sept. 9, 2011. Photo by Wendy McPherson, U.S. Geological Survey. HELP FOR CONOWINGO DAM SEDIMENT: Gov. Larry Hogan is asking the private sector for ideas on how to prevent massive reservoirs of sediment from spilling over the Conowingo Dam and polluting the Chesapeake Bay, a decision that at least one Carroll official believes will reduce the tax burden on local residents, John Kelvey reports for the Carroll County Times. Scott Dance and Erin Cox of the Sun report that, warning that years of progress at cleaning up waterways “could easily be wiped out” by a single hurricane inundating the Susquehanna River, the governor said he is also gathering various state agencies in a new work group to oversee the issue. The Hogan administration announced it will be looking to determine whether dredging the dam and re-use of dredged materials can be done efficiently. The dam is on the Susquehanna River, the largest tributary to the bay. It provides about half of its fresh water. It also accounts for about half of the bay’s nitrogen pollution, as well as about a quarter of its phosphorous and sediment pollution, according to an AP story at WTOP-AM. TESTING COMMISSION RELEASES FINAL REPORT: MarylandReporter.com writes that the Commission to Review Maryland’s Use of Assessments in Public Schools has posted its final report on how to reduce standardized testing. As reported here last month, the commission realized it had little power on its own to reduce testing, but must leave it to the state and local school boards to take action. Under the law creating the commission, local boards of education have until Sept. 1 to adopt or reject the commission’s recommendation, and the State Board of Education has until Oct. 1. Maryland students will not see fewer tests, but those tests could become less disruptive, according to final recommendations by the commission. Lawmakers, teachers and their unions have been clamoring for years to ease testing, criticizing how it saps classroom time, reports Jeremy Bauer-Wolf for the Frederick News Post. Rachel Baye of WYPR-FM reports that among the commission recommendations was a suggestion that local jurisdictions examine their own required tests. COURT RECOGNIZES ‘DE FACTO PARENT:’ In a landmark family-law decision, Maryland’s top court ruled Thursday that an adult intimately connected to a child’s upbringing can be regarded as a “de facto parent” and entitled to visitation and a share of custody so long as the best interests of the child are served, Steve Lash reports for the Daily Record. The decision also preserves a biological or adoptive parents’ “fundamental right to direct and govern the care, custody and control of their children.” But it acknowledges that “a legal parent does not have a right to voluntarily cultivate their child’s parental-type relationship with a third party and then seek to extinguish it,” Judge Sally D. Adkins wrote for the high court. MARYLAND’s TRUMP SUPPORTERS: Maryland is a state where centrists have long dominated Republican politics, but it will be represented by some of the most die-hard Donald Trump supporters in the nation when the Republican Party meets this month to formally choose a presidential nominee, John Fritze reports for the Sun. Neither Erich Bean nor Mike McKay will be in Cleveland for the Republican National Convention July 18-21, but each will be glued to a TV screen watching what they expect to be a historic event. “We will never again see something like this take place, a true political outsider being in the position to become president of the United States,” said McKay, a Maryland delegate representing Allegany and Washington counties in Annapolis, writes Michael Sawyers for the Cumberland Times News. MO CO REAFFIRMS SOLIDARITY WITH MUSLIMS: Top officials in Montgomery County will be signing a statement reaffirming the county’s solidarity with the Muslim community, according to an AP report in the Daily Record.